Beuronese art was revolutionary for its time, and also characteristic of its time. It offered a stylized, simplified, and hieratic approach to art which went against the grain of contemporary romantic forms. Yet its search for the pure and ideal is not unlike the movements in the revival of the liturgy and music – and even non-Catholic and “secular” counterparts such as the utopian movements or, as in literature, the transcendentalist movement. Abbot Frowin, also a child of his time, was searching for the simplicity of a “pure” romanesque. It is not surprising that he saw the “pure” simplicity of Beuronese art as fitting decoration for his church. Between 1893 and 1897, several monks of Conception, most notable Lukas Etlin (d. 1927), Hildebrand Roseler (d. 1923), and Ildephonse Kuhn (d. 1921), the latter two of whom had studied art at Beuron, redecorated the walls and ceiling of the Abbey church primarily in the Beuronese manner, retaining elements of the original Victorian stenciling. This is a curious anomaly since one of the Beuronese canons was that all decoration should be done without a stencil. Conception’s was the first church in the United States so decorated. The apse painting of the Immaculate Conception is an original work by Lukas Etlin. 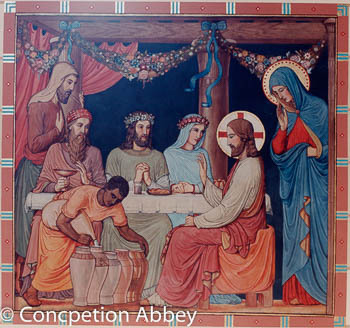 The eighteen murals in the central axis are copies from twenty-two scenes of the Life of Mary cycle painted in the church of Emaus Abbey in Prague, Czechoslovakia, under the direction of Lenz, Wüger, and Steiner between the years 1880-1887. Wüger, who favored less stylized figures and softer tones, was the principal artist behind this project. The church at Emaus was bombed and gutted by fire in 1945, leaving Conception’s murals as perhaps the most complete replica of the Emaus originals. The four transept murals are scenes from the Life of Benedict cycle originally painted at the abbey of Monte Cassino in Italy. Executed under the direction of Lenz and Wüger in the years 1876-1880, they were destroyed in the bombardment of that monastery during World War II. The narrative source for “The Annunciation,” one of the most frequent subjects of Christian art, is found in the Gospel of Luke (1:26-38). 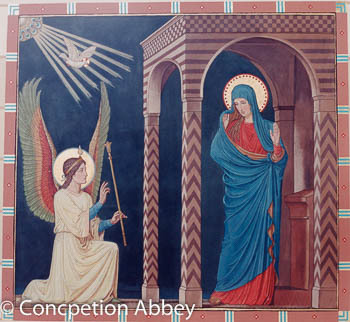 The angel Gabriel tells Mary that she is to be the mother of the Savior. Mary is here shown on a porch, her hands raised in surprise or wonderment – surprise at the apparition or wonderment at the message. Gabriel, holding a staff, is kneeling while delivering his message. The Holy Spirit appears amidst seven rays of light, all emanating from God. This fresco is relatively simple in its portrayal of the event, avoiding many of the details popular in earlier works. The architecture of the portico serves to frame the important figure of the Blessed Virgin and divides the panel neatly into two sections. Garlands of roses, lilies, and daisies hanging between the pillars of “The Wedding Feast at Cana” panel connect this mural with the preceding panel’s garlands. As in the preceding panel, Jesus sits before a pillar. He shares the spot just off center with the wedding couple and his mother. The bright haloes of Mary and Joseph add weight to their side of the panel, offsetting the imbalance of the composition. The central figures of Jesus and the wedding couple are balanced on one side by Mary, whispering to Jesus that the wine has given out and on the opposite side a servant whispering the same to the steward. Jesus raises his hands in blessing, transforming the water poured by the other servant. This fresco unites all of the narrative elements of the story in one composition. 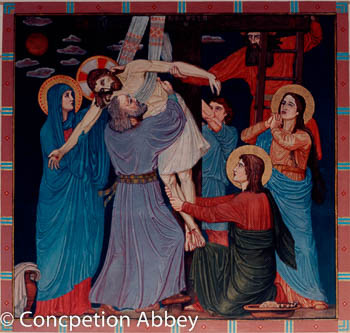 The account of Jesus’ followers removing his body from the Cross is found in all four Gospels and is called “The Deposition from the Cross,” or “The Descent from the Cross.” Early representations of this event presented only Joseph of Arimathaea and the two Marys, but later other figures were added — the Blessed Virgin, Nicodemus, John, and various servants of Joseph. In the basilica’s version, on the north side of the choir, we see Jesus being lowered by a young man with a muscular arm.Joseph of Arimathaea has climbed a ladder and his helping by grasping Jesus’ arm. Nicodemus and the Blessed Virgin receive the body of Jesus, while the Apostle John, portrayed as a young man, holds the legs. Mary Magdalene stands beneath the ladder, with an anguished face and upraised arms. In the upper left corner, the sun is still darkened. At the bottom of the fresco are an ewer and cloth, as well as a basin and sponge for washing the body of Jesus. “The Coronation of the Virgin” is part of the iconography of the Assumption of the Blessed Virgin Mary, which is often subdivided into four parts — the dormition, the burial, the assumption, and the coronation. The coronation of Mary is not a biblical scene, or even a prominent one in the Golden Legend, but is based on Psalm 44: 11-12 in the Vulgate and the Song of Songs (4: 8). It is paraphrased as “Veni electa mea…in thronum meum” (“Come, chosen one to my throne”). 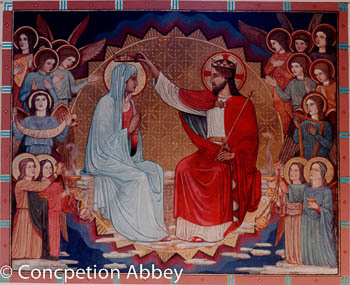 The usual arrangement for the coronation, as seen in the basilica’s mural, is to place Christ and Mary beside each other, but there are several variations. Christ stretches out his hand to crown the Blessed Virgin. Angels surround them. Two incensing angels, one presenting a brazier, the other swinging a thurible, are in the lower corners. On the left side, an angel holds a banderole that exclaims: “Salve Regina!” Opposite him, another angel plays the harp. In the upper left corner is a band of angels, while various choirs of angels are represented in the upper right corner.